Date Visited: Feb 17, 2012. We have visited Stonegrill a number of times, mainly because of the coupons we've purchased which gaved us about a 50% discount. If it wasn't for the coupons, it definitely wouldn't be on the top of our list because the food isn't amazing and the service is horrible. Everytime we've visited, the service was extremely slow and the servers were not friendly except at our last visit we had a very friendly server who seemed like the manager. Although the decor is quite modern and located downtown, the place is always extremely loud and feels like 'Asian Invasion'. 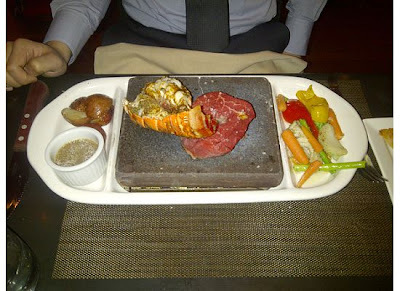 The famous stonegrill meals to me are simply a gimmick with a piece of stone that is extremely hot, and customers could cook their meat to their liking. I must agree to have the piece of meat immediately cooked before you eat it is a pleasure, but it is not greatly different than the Korean BBQ or Japanese tepanyaki experience. The important thing for the restaurant is to provide good meat as no cooking from the chef is involved. On that note, the price for this meal suddenly seems slightly unjustified although the meat is quite tender and fresh. The sides that come along with the stonegrill dish is okay, the potatoes are quite crispy but the vegetatives are heavily seasoned and not extremely tasty. The gravy itself has improved greatly since the first time we've visited the restaurant, but it is slightly thick to my liking. For those who like meet other than the typical beef, pork and chicken, then they may find this place more exciting. Out of all the stonegrill dishes, the surf and turf is by far the best option, as it is only $2 more than the beef tenderloin but also has a lobster tail (yes and the steak is the same size!). In the past, one of our favorite dish is the appetizer trio, which included a salad, calimari, and ribs. 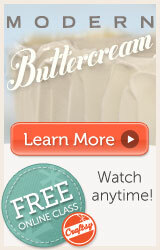 However, the last time we've visited this restaurant, this dish is no longer availalble. The best dish in stonegrill is their seafood linguini. I am not a seafood fan myself, but every time I visit I order this dish because the sauce is extremely delicious. 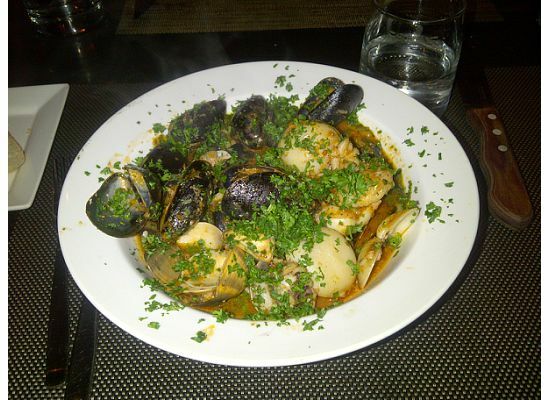 The sauce is so good that it can even cover the 'fishy' taste and slimy texture of the shellfish in this dish. With the amount of scallop, large shrims, squid, and shellfish, this dish was definitely worth every penny. Overall, stonegrill is a restaurant worth trying for the different experience and definitely the seafood linguini, but you probably wont be going back all that often. 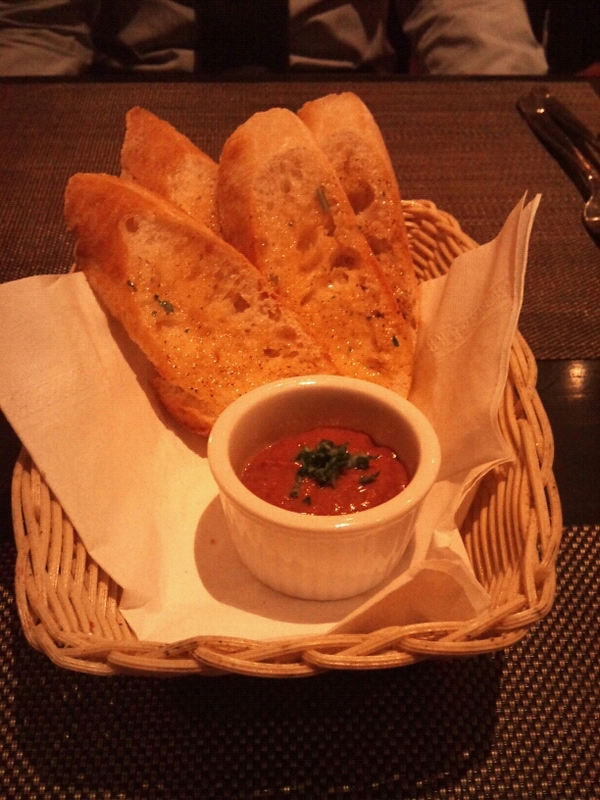 the appetizer "combo" was great (even tho it costs $30) but too bad that it is no longer available. the atomsphere/setting: 6 - 6.5 / 10. the overall atomsphere/setting is nice; the "turn-off"s are the "spacing" of the tables and the guests (who are quite noisy sometimes). service: 3/10. Their service was horrible. Other than that their infamous stonegrill dishes are decent. However, it will be a great experience for the first-timers: You get to cook the meat on the heated stone on your own and you have a variety of meat and seafood to choose from, such as venison, bison, ostrich, kangeroo, salmon, lobster, etc. Their best dishes are the seafood linguini and the appetizer combo (which is no longer available).